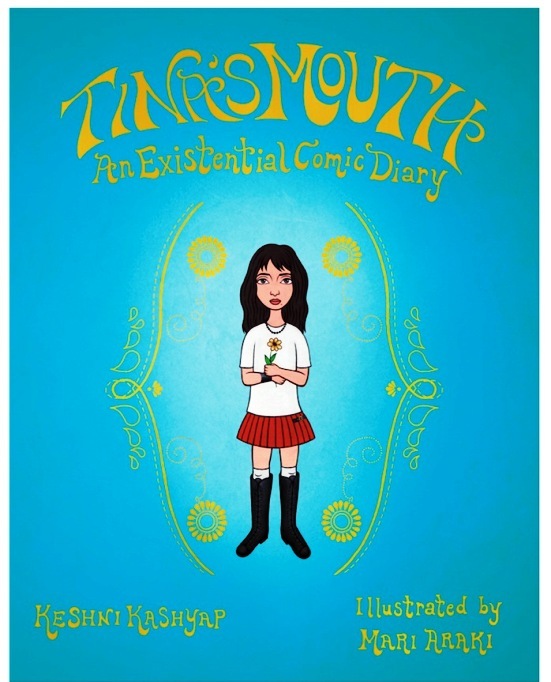 Tina’s Mouth: An Existential Comic Diary by Keshni Kashyap; illustrated by Mari Araki. Houghton Mifflin, 2011. Currently available. Face Value: I found it eye catching. The golden graphics reminded me of henna tattoos I have seen, and I immediately wondered if Tina was a character of Indian descent. I was intrigued enough to pick it up off of the library shelf and eventually take it home with me. I had never heard of this book before I saw it at the library. If the cover was appealing enough to get picky old me to check it out, I’d say that it’s pretty good. I do not often check out or buy books that I haven’t heard of or read about beforehand. Does it break the slate? Thoroughly. Tina’s existential journey promotes a level of introspection that we as a culture do not typically encourage of adolescent girls, and I see that as a good thing. If teen girls had more time and space to self-reflect, I firmly believe that high school would be less awful. Who would we give it to? Any teen girl, really. Tina’s experiences are rooted in her unique cultural heritage and school atmosphere, but there are many elements that translate to girls everywhere: finding oneself, figuring out crushes, and co-existing peacefully with your family. Review: Sometimes things in your life take a turn for the worse. In Tina’s case, everything heads into a downward spiral when her best friend abandons her, citing irreconcilable differences – and devotion to her new boyfriend. Now that she’s alone and has a lot of time to think, Tina has become devoted to Sartre. Yes, that Sartre – Jean-Paul. This entire graphic novel is written as a series of introspective letters to Mr. Sartre. And it is just as quirky and amazing as it sounds. Tina attends an expensive, alternative school at which she can take classes like Russian Literature and Existentialism. Her existentialism course has provoked her into thinking a lot. Maybe too much. Tina finds herself adrift and seeks people and ideas upon which she can anchor herself. She auditions for the school play and lands the lead role (you can tell it’s a very special school because they’re doing Rashomon). She reaches out to new people and finds them intellectually stimulating. Tina’s personal exploration leads to social growth, and her quiet reflection on these new connections comes through brilliant illustration by Araki and narrative written by Kashyap. Tina’s ponderings crystallize through the theme of the mouth. She connects with a story about Krishna and the universe that exists inside his mouth – the world inside of him. Her own longings focus on her mouth, as she desperately wants to be kissed by someone who cares about her. In a way, Tina’s mouth also helps her to resolve some of the conflict and drama in her life. It is through conversation and open communication that she negotiates a truce with her friend, encourages her brother to be his true self, and finds a boy who understands her on some level. There are detours along the way, but by working it out with Mr. Sartre, Tina finds her way. I started this book with a healthy dose of skepticism, thinking, “How relatable is an existential graphic novel about an Indian teen really going to be?” In an amazing way, Tina’s bout with existentialism and a baffling crush are experiences that every high school student goes through at some point. Maybe they don’t call it existentialism, and maybe that crush takes a different form, but it’s still a common experience to question your identity and have unrequited love. Yes, Tina’s weirdo school and hipster friends may be specific to the wealthy Californian lifestyle, but every school has its oddballs. And it’s the teens who feel that they are the oddballs who need books like Tina’s Mouth. I am surprised that this book has not received more attention in the YA lit blogging community, because it is truly outstanding. This entry was posted in Graphic Novels, Reviews, Young Adult and tagged existentialism, Graphic Novel, high school, Indian culture, Jean-Paul Sartre, philosophy, ya. Bookmark the permalink.